Encourage your young executives or budding novelist to let their creativity flow. 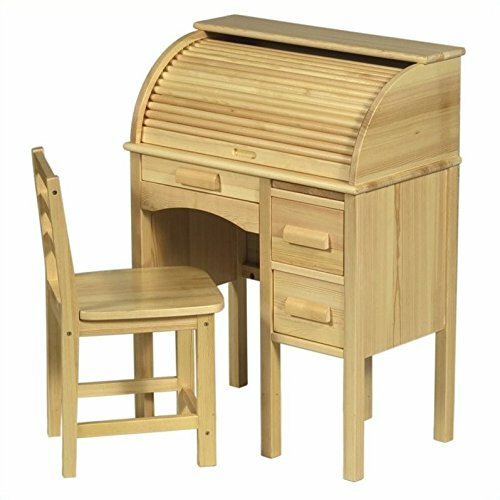 This beautiful replica of the classic roll-top desk will inspire your children to record their adventures or close that "big deal". Re-created in natural wood color. This heirloom quality desk will be handed down from generation to generation. Features: One utility drawer and lap drawer and a pull-out writing board. ; The two file drawers are perfect for papers and storage. ; The roll top interior has multiple storage compartments. ; pigeon holes and pencil drawer an easy open/close tambour door. ; Chair included. ; Designed for Ages: 3 Plus. ; Adult assembly required.. Care Instructions: To clean your product, use mild soap and water on a damp cloth. ; Do not use window cleaners or cleaning abrasives as they will scratch the surface and could damage the protective coating.. Specifications: Dimensions: 36" H x 14.5" W x 27" L ; Weight: 55 lbs. .